Since 2011 the Supreme Court of India seems to have got the message that relying on Wikipedia is simply not a good idea. India’s high courts? Not so much. The Supreme Court of India, under Article 141 of the Constitution, and the high courts lay down the law of the land. Wikipedia is an online encyclopedia where anyone can post and edit any article about anything. On their own, each of them are wonderful institutions benefiting humankind. Put them together and you have a recipe for disaster. In no fewer than 11 reported cases, most related to taxation, the Supreme Court of India has placed express reliance upon a definition of a word or a phrase found in Wikipedia. These include Zener diode (CTT v Parikh Gramodyog Sansthan, 2010), bubblegum (CIT v Associated Distributors, 2008) and beer (State of UP v Mohan Meakin Breweries, 2011). The principal users of Wikipedia seem to have been justices S.H. Kapadia (before he became Chief Justice of India) and Markandey Katju, both of whom cited it in three different judgements, though at least five other judges have cited it at least once. The fact that Wikipedia is a freely available resource that anyone can edit seemed to have been missed by the Supreme Court for the better part of five years; the first citation of Wikipedia was in 2006 (Anjaleem Enterprises v CCE, Ahmedabad) and the last in 2011 (State of UP v Mohan Meakin Breweries). However, Sinha had a change of heart in 2008, when he reached for Wikipedia to appreciate the definition of petroleum jelly (Ponds India v CTT, Lucknow) with nary a mention of his earlier misgivings. But when an intrepid counsel tried to cite Wikipedia for the process to make steel, Sinha once again remembered his misgivings and refused to rely on Wikipedia (but confusingly, he nevertheless cited from both of his earlier judgements where he did and did not follow a Wikipedia definition). However, after January 2011, all references to Wikipedia in Supreme Court judgements stopped abruptly. It appears to have been Katju’s reference to Wikipedia for what is a common law marriage (D Velusamy v D Patchaiammal, 2010) that drove the last nail into Wikipedia’s apex court coffin. The ensuing controversy over his insensitive use of the word keep (though the word itself didn’t appear in the Wikipedia article) and the disapproval of many, including this newspaper, to such casual and unstructured research by the Supreme Court seems to have hit home with the apex court judges, and we find only one further reference to Wikipedia after that. In State of UP v Mohan Meakin Breweries (2011) the Supreme Court checks both Wikipedia and the more authoritative Encyclopaedia Britannica before extracting from Wikipedia, simply because it’s shorter. Should lawyers breathe in peace now that the law is being laid down on the basis of stolid definitions from hide-bound legal dictionaries and lexicons? 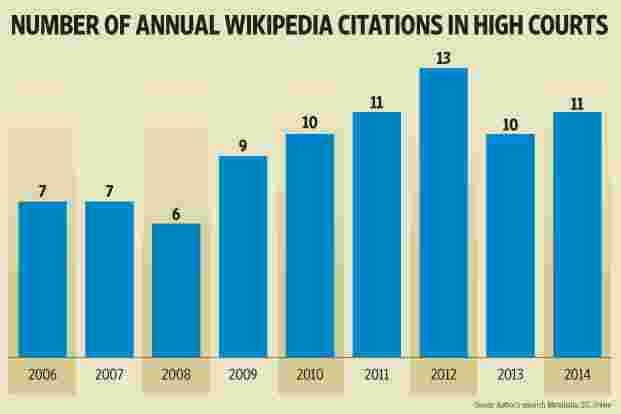 Wikipedia use remains fairly widespread among the high courts of India. 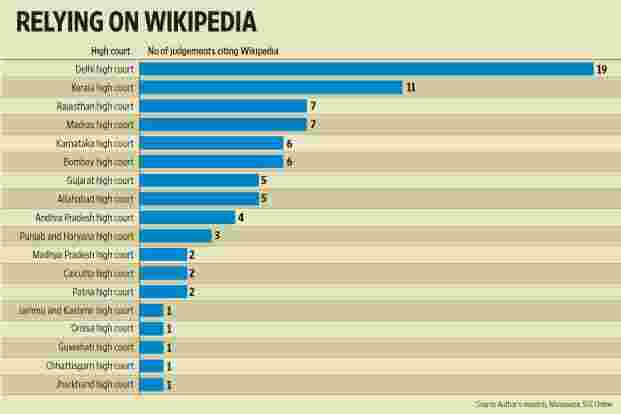 No fewer than 18 out of 20 high courts in the last 10 years (excluding the newly constituted high courts of Manipur, Meghalaya, and Tripura) have referred to Wikipedia as an authority at least once in their judgements. A detailed search of legal databases reveals that no fewer than 84 high court judgements that cite Wikipedia as an authority. The topics referred to range from the meaning of the term Allah (Kerala high court, 2006), to what a /—the slash symbol—is commonly used for (Patna high court, 2012) to the definition of destructive cults (Karnataka high court, 2014). And ironically, the most popular reference to a Wikipedia article seems to be common law marriage, following the Supreme Court’s lead in D Velusamy v D Patchaiammal (2011). Apart from the allegations of bias, plagiarism and inaccuracy that plague many entries, there is also the possibility that parties may make malicious use of Wikipedia to bolster their cases. It is entirely conceivable that an otherwise innocuous Wikipedia entry may be changed in just the right manner, just before a hearing, with judges and lawyers being completely unaware that it has happened. In fact, in one case, the Bombay high court has voiced its suspicions to this very effect about the plaintiffs before it (Techlegal Solutions v Genelia Riteish Deshmukh, 2014). And it is likely that before district courts, magistrates or tribunals the use (and potential misuse) of Wikipedia, perhaps emboldened by the continuing practice in higher courts, is even more widespread and subject to less oversight. It is not as if high courts are unaware of the problems with Wikipedia. Sinha’s (albeit contradictory) statement on its authenticity is cited by high courts on at least two occasions to refuse to follow Wikipedia. Yet, they appear to continue doing so when they wish to. It is high time that high courts follow the Supreme Court’s example and abandon references to Wikipedia as an authority on anything. Alok Prasanna Kumar is a senior resident fellow of the Vidhi Centre for Legal Policy focusing on judicial reform.